Part of Aboyo State in east Irukandji, Cabria Island is one of three islands that originally formed an L shape around Minoan Atolls. Cabria Island was a popular sim, made even moreso when I attached another bay, Upper Aboyo Passage, to its northern shore. Cabria Island had a number of large and small land owners, and throughout its history, blocks rarely changed hands. When properties were sold privately by residents, buyers paid a premium for the privilege. The builds created by landowners on Cabria Island were very well designed and constructed, and complimented the feel of the greater kingdom. Cabria Island was hand terraformed, and acted as a junction between two rivers, the Aboyo River which ran north-south, and the Maskari River which flowed eastward. Clockwise from southeast, neighbouring regions that adjoined Cabria Island were Grand Aboyo Island, Tora Tora Passage (later Toraboyo Beach), Mount Aboyo Island, Minoan Atolls, Grand Irukandji, and Upper Aboyo Passage. 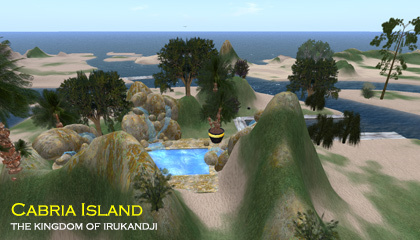 When I began decommissioning Irukandji on the Second Life grid in late 2009, I sold the Cabria Island sim to one of my former land owners, Myles Capalini. Myles had been a long term resident on several sims, including Grand Irukandji. 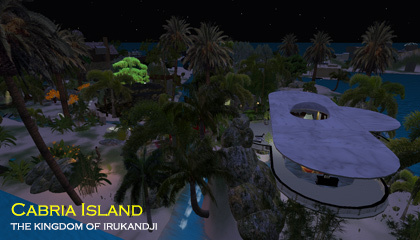 When I built Irukandji v2 in InWorldz some years later, I didn't recreate Cabria Island, primarily because of IW's low grid population. Instead, it, and most of the old Aboyan regions were represented more vaguely as Aboyo Island, Aboyo Sea and Toraboyo Beach.